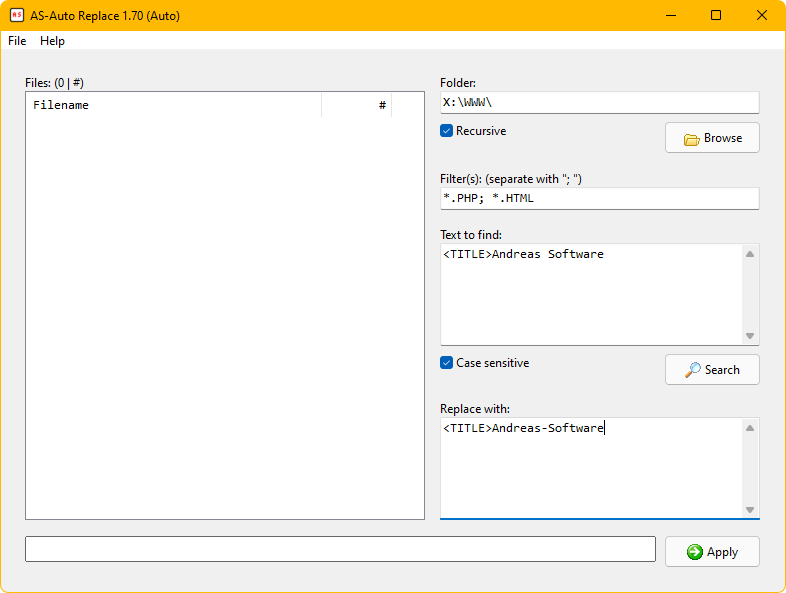 AS-Auto Replace 1.70 - Search and replace in multiple text-based files at once. This program is designed to facilitate the search and replace operations in several text-based files at once. Ideal for developers. The program is working very quickly. Shows the number of occurrences of the search term for each file and totally in the search. You can open a file with Windows Notepad when it is selected in the search list by pressing [ENTER] or by double-clicking. Press [F12] to select a custom editor (EXE file). The program will remember this and use it from now on. Press [F8] to switch between the encoding modes (Auto, ANSI, UTF-16/LE and UTF-8). This applies to both reading and writing. Also keep in mind that the Auto mode (and the program) only supports these three encoding modes.